It’s been one of those weeks, so when it came to the weekend I was wanting to immerse myself in my smurfs. My sister in law refers to my smurf collecting as my ‘yoga’ as it is my way to switch off from everything else and get totally absorbed by my smurfs. Another way, some people switch off from everything around them is by fishing. Fisherman was one of the last smurfs produced by Bully in 1979. After 1979 it was sold by Schleich but continued to be sold with Bully markings until around 1984. It was only sold by Schleich with Schleich markings between 1984 to 1986. Fisherman was also produced out of Hong Kong, it was sold in Australia and New Zealand by BP and also in the US by Wallace Berrie. Wallace Berrie sold Fisherman from 1981 to 1984. In the Smurf Collectors Club International Newsletters Issue 14 and 15 from 1989 they list that there are two mould variations to be found. One piece mould. Pole is part of the Smurf mould! Special Note: The hook should be attached to the foot! It is thought Schleich had problems with the one piece mould and at some stage changed the rod to a seperate plastic rod. This may have been around 1983 when Schleich started selling Combi Sets. Schleich ceased making Fisherman after 1986 and has not been reproduced since. Angler comes with a yellow fishing rod with a detachable red fish on it, a dark brown log and sometimes with or without a yellow tub. Angler was first produced by Schleich in 1979 and was sold up until 1986. It was later sold as a bonus figurine with the French magazine Je Collectionne les Schtroumpfs in 2007. It was also produced out of Hong Kong around 1980 and sold in Australia by BP and the US by Wallace Berrie. I don’t believe this version was ever sold with a yellow tub. There is also a very rare version with a brown fishing rod that came without a yellow tub. I am not sure of it’s origins or when it was produced but I know of two other collectors who has this one. The Angler was also used by Schleich as part of their Smurf Office Series, released between 1983 to 1986. Angler was part of Smurf Office Series 1 #53101 which included a tray for paper clips with Angler holding a magnet fishing-rod. 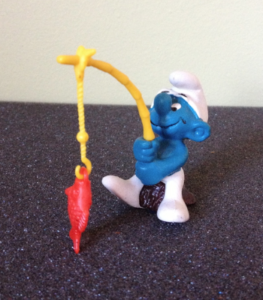 I hope you have enjoyed reading about the different fishing smurfs there are available to collect. 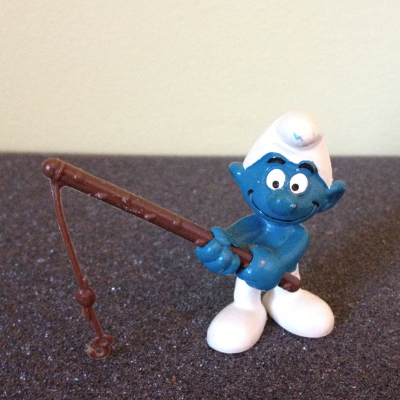 There are some variations of both Fisherman and Angler that I would like to add to my collection, along with many other smurfs.